Many of you know we lived in New Orleans for 14 years before moving to Maryland. In August, I returned for the first time since Hurricane Katrina hit. I was last there in June 2005…two months before everything changed. You all know that New Orleans was badly flooded after the flood control system that surrounds the city failed in a number of places. For a good illustration of the chronology and extent of the flooding, check out the Times-Picayune web site’s illustration of the events of 29 August to 1 September. Those of you that have been to New Orleans know it is different from any other American city. Much of that difference can be very appealing. It is the best place I know for eating, where you can get excellent food from the dives and hole-in-the-wall sandwich shops up to the ritzy, haute cuisine joints. The place drips with architecture and history and culture…the kind of social gumbo you would expect after being ruled by the French, Spanish and the Confederacy. A place like this, where slaves were brought in from Africa and the Caribbean, where jazz music was born and where the largest river on the continent is just a few miles from the end of its 2300-mile trip to the sea is special in so many ways. I had to return to my old hometown after seeing so many storm stories on TV and reading so much about it. I knew I wanted to get out into the neighborhoods to see what the area looked like. I also wanted to take pictures to chronicle the condition of familiar places a year later. However, I realize I was not prepared for the experience. Instead of forwarding some images to those friends who knew I was going, I feel compelled to add more words to the pictures. We have friends in the city. We have friends and family who have visited the city and there are folks who have never been to the city. This illustrated essay is for people who have not been to New Orleans for a long time or have never been there. While I can’t adequately describe what those who lived through this disaster have experienced, I think it is important for the rest of the nation to get a better sense of both the extent of the devastation AND the failures of the systems we depend on at times like this. The reasons why I need to do more than forward a few images are many. The news can convey only so much. The pictures we have all seen can have impact. I was not ready to see SO MUCH of my old hometown devastated with mile after mile of empty, broken neighborhoods…and all this, a year later. Today, you can see the Saints play in the Dome and advertising that says New Orleans is ‘Open For Business’ and this is true. Many of the popular attractions are up and running. But, so much of the city is as destroyed as it was a year ago. When you’re there, ALL the senses alert to what has changed. While your eyes convey the shock of shattered homes and the loss of familiar landmarks, other senses remind you about what is different…the smells of mold and rot; the absence of sound in deserted places; the feel of things buried in mud and exposed to the elements. More than 80% of the city was flooded. In some areas, the water rose to the roof. Over 1300 were killed. 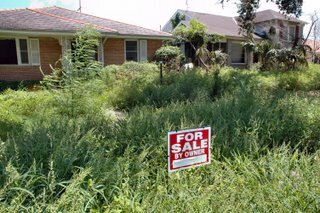 We often hear about the flooded Lower 9th Ward and the special hardships faced by this working class, black neighborhood where home ownership is among the highest in this [or any] city. We hear less about the more affluent areas that were also destroyed. The city’s population is less than half of what it was before the storm. Basic services – water, electricity and garbage pickup – are intermittent. Though they are starting to return, the city lost two thirds of its restaurants. The city lost more than half its doctors and hospital space and but a fraction of its mental health care capability remains – both practitioners and treatment space…this, at a time when anxiety, depression, post traumatic stress, violence and suicide have all increased. 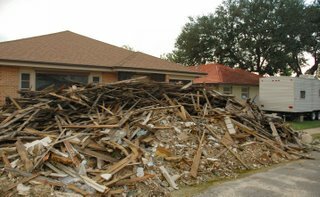 It is estimated that 50 million cubic yards of debris needs to be removed from New Orleans. Less than 20% of this total has been managed to date. People are not returning because there is nothing to return to. Imagine losing EVERYTHING. Not just your house and all the stuff inside it…the memorabilia and keepsakes…a lifetime’s work and all your connections to the past. Then consider what it’s like to lose your neighborhood, the kid’s schools, your job and friends. Then imagine, on top of that, that your government ignored you. Nowadays, so many have bought into the conservative rhetoric about our need for less government. While there’s no shortage of talking heads and politicians who advocate cutting all the things they don’t want, few among them expect less police and fire protection. They all think that Defense and Homeland Security deserve all the public money they can get. We always clamor for more roads to meet our multiple-vehicle lifestyles but nobody wants to pay for any of it. It’s like the overly simplistic ‘either/or’ debate our leaders apply to the war – it’s not about “staying the course” vs. “cut and run”. It’s about doing the job right. We still have government agencies with names and missions related to ‘rescue’ and ‘emergency management’ and ‘safety’. These agencies failed…miserably and they continue to fail today. One night during my visit, I had dinner with a few heroes. Everyone had his or her ‘dumbest FEMA story’. One is a doctor, a prominent neurosurgeon, who spent days holed up in a hospital, working to keep critical care patients alive after the infrastructure collapsed. The day a truck finally arrived to bring fuel for the generators that were the only source of electricity, the onsite FEMA rep wanted to turn the truck away…because it lacked the right paperwork. Another is a Texas Parks and Wildlife officer. In the first days of the flooding, his department sent airboats to rescue stranded citizens. He saw FEMA people try to prevent other rescue professionals from going to work and wanted instead to send them to Atlanta for diversity/sensitivity training[!]. “You’re doin’ a heck of a job, Brownie”. All this at a time when our national leadership actively opposes and reduces social programs while it poorly manages what it hasn’t cut. This at a time when our Treasury is drained to enrich favored constituents. This at a time when vast sums are diverted to an unpopular, mismanaged, disaster in Iraq. Someone wrote that the hardest thing to accept is the loss of self-determination. It has to be a major factor in people’s ability to recover. So very much depends on others…the infrastructure, the social support systems and government. You can be committed, resourceful and even have some money but so much has to be overcome. With businesses destroyed, there are no jobs. With the loss of citizens, there are no customers for the businesses. With no jobs and customers, there is less tax revenue to fund government services. 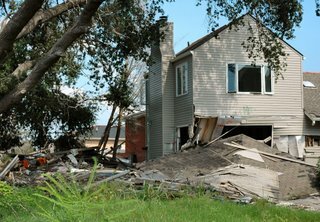 Flood insurance has to pay off or you can’t rebuild. The federal government has to restore the flood protection system and the city must zone and plan the neighborhoods. I understand that New Orleans and Louisiana are not shining examples of good governance. That the federal effort failed so miserably only compounded the situation. It was a perfect storm…the harmonic convergence of government ineptitude. Only residents of that great state can fix their problems but all of us can address what happens in Washington. Little of the damage documented here was caused by the storm itself. 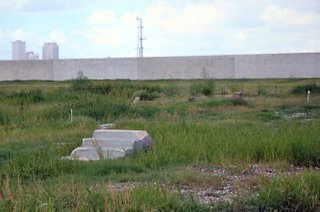 The devastation was caused by failures in the flood control system. The storm had passed the city when the levees and floodwalls broke. I believe that the flood protection system was poorly designed, badly engineered and not well maintained. 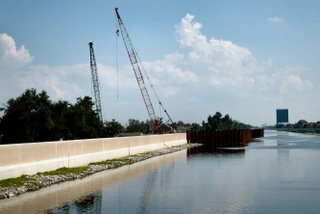 The levees failed under much less than Category 5 conditions and they are now being restored to less than Category 5 capability…this is the most tragic failure of the civil engineering system in U.S. history and it is a federal responsibility. Our government had personnel and relief supplies on the ground in Indonesia…the other side of the world…within two days of the tsunami. 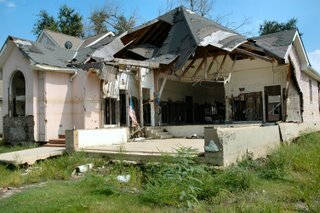 Four days after Katrina, there was no federal presence in New Orleans. Between the storm, the lack of response, the bad response and the politically calculated response, New Orleans was beaten up quite well. We’re talking about AMERICA here and American citizens dying in the streets for lack of food, water and medicine. On top of that, this disaster was predicted. The conditions that lead to the flooding of the city have been understood for decades. A coordinated emergency management exercise for this same storm scenario was run in 2002. After the flood, I got a note from a friend who recalled me telling him how this would happen…in 1982. Our Federal Emergency Management Agency, absorbed and distracted by inept Homeland Security oversight and incompetent bureaucrats, bungled its job to manage the emergency. However, the buck stopped at a desk whose occupant was not interested. He was not curious and when informed, he let it pass in a display of arrogance that confirmed a belief that the victims were not important. 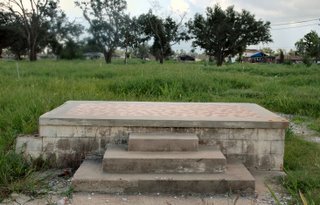 Forty years earlier, after Hurricane Betsy heavily damaged New Orleans, President Johnson was on the ground in the Lower Ninth Ward, in the dark, to reassure people that the nation cared. 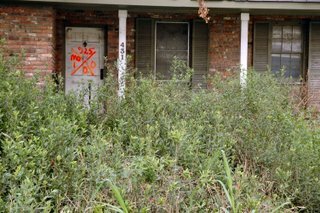 A year later, some residents are returning to try and salvage their homes…but there are vast areas of the city that are empty and dark. Remember that on September 15, 2005, our President promised to re-build and restore this important commercial and cultural center. While some monies are starting to move to areas of need, the actions have not lived up to the words. We must remember when government speaks of vast sums that are “allocated / budgeted / dedicated”, etc., this is not the same as “delivered or spent”. This was a disaster of biblical proportions. Vast areas of the city are destroyed. It will take more than a generation to recover and the signs of destruction will linger for decades. I think people will adopt new reference language that notes conditions before and after the storm. On the other hand, the city is not lost and it MUST be saved and restored. It is too important. For all its flaws, it is still a world-class destination and it is open for business. The things most people go to New Orleans to see are still there. Downtown, the French Quarter and Garden District are up and running and New Orleans needs our patronage and support in order to fund the recovery of the rest of the city. Yes, the city is below sea level…so is 65% of the Netherlands. They have a state-of-the-art flood protection system there. This city is one of the country’s major seaports and it directs commerce through the largest river and commercial waterway on the North American continent. One would think that alone would justify adequate flood protection…not to mention it’s unique cultural and historic significance. Attached are some images from around the city. Please view them and give some positive thought to some Americans who have been through Hell. Consider support for charities that are doing so much in that area. As Election Day approaches, consider also how you can improve our leadership in Washington. I suppose the reason I take pictures is that it fits with my scientific sensibilities…objectivity, truth and all. I have been accused [accurately] of lacking emotion. It’s difficult being objective and unemotional after seeing what has happened to this great and important city and the responses of those responsible for doing something about it. 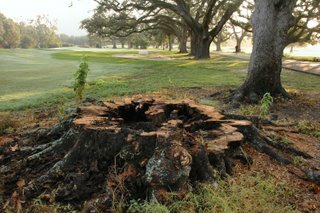 Audubon Park - Although live oak trees can stand some water, a few did not make it. 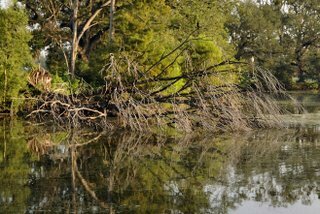 Audubon Park – Retrieving trees that fell into the lagoon is a low priority. 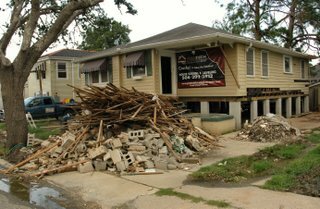 Mid City – Many homes have large debris piles by the street. Debris and FEMA trailers are a sign that someone is there, attempting to recover the property. Far too many houses are as they were a year ago…empty, gutted, abandoned. Mid City – Our former home. The only one in the neighborhood being raised to avoid future floods. 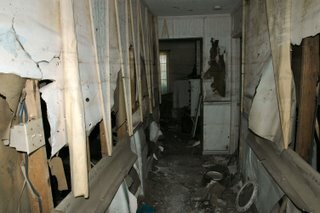 Lakeview – This abandoned home has the markings made by military search teams after the flooding subsided. The left quadrant notes that a unit from Missouri searched the place on the date shown on the top. The right and lower quadrants, respectively, note the number of people rescued and found dead. Lakeview – Some lots have had the destroyed houses removed. 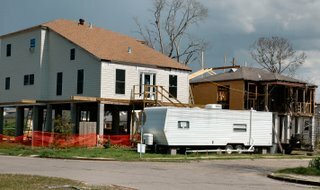 While I saw many FEMA trailers and houses under repair, I saw no attempts to build new houses on cleared lots. 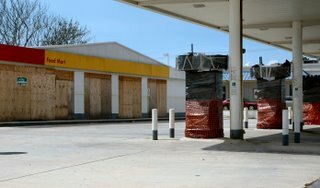 These once-desirable locations are all in limbo and await official decisions on insurance payouts, flood protection, zoning, infrastructure restoration and more. Lakeview – Wooden houses float away. Brick houses break apart. Lakeview – We have seen how high wind can create missiles of objects carried aloft. Water will do the same. Big objects that float, like this garage roof, will slam into whatever is in the way and compound the damage. 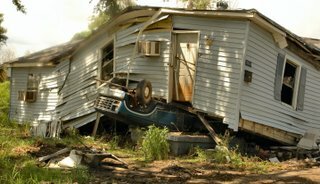 Lakeview – This old, frame shotgun house floated off its foundation until the tree stopped it. Lakeview - 17th Street Canal repairs in progress. 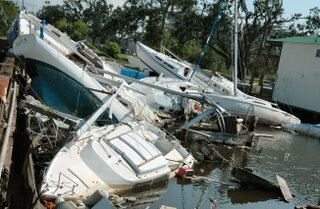 Lake Pontchartrain waterfront – The marina is still devastated in places. 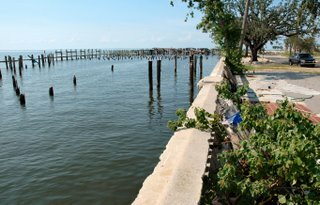 Lake Pontchartrain waterfront – Many residents and visitors know this collection of seafood restaurants near the marina. Fitzgerald’s, Deanie’s, Bruning’s…all gone. Carrolton – Whether it was ignited natural gas leaks or arson, it is sad and ironic when buildings surrounded by water burn down. 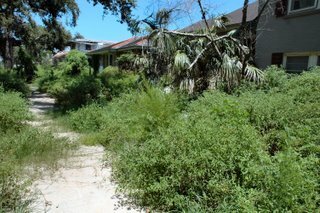 This was a block of large, old homes, a few of which were subdivided into apartments, close to Tulane, Loyola and Xavier Universities. 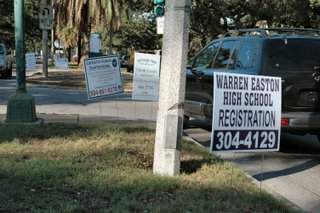 The entire New Orleans Public School system was closed for a year. Many schools were in such poor shape and performed badly enough to cause the state to take them over before the storm hit. One of the more promising actions has been the establishment of new charter schools across the city. No longer constrained by mandatory districts, parents can enroll children in any school they wish. The prospect of schools competing for enrollment is encouraging and should force schools to improve performance. The sign in the middle notes the new Priestley School of Architecture and Construction. Our good friends, Ray and Bev Nichols have spearheaded the creation of a new high school that will specialize in the building arts. The goal is to train people who will restore this damaged region. Lakeview – Many doors were still open. I could not bring myself to enter and further violate these spaces. Lakeview, Canal Boulevard – This was a busy street; a bus route between the neighborhoods to the north and downtown. Now, it’s mostly empty and very quiet. Manicured lawns have given way to Nature’s succession. It doesn’t take long for the humid sub-tropics to take over. 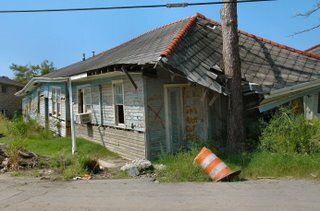 Near the University of New Orleans and the London Avenue Canal. It may look out of place but it should survive the next floodwall failure. Elysian Fields - No citizens = no business. No business = no jobs. No jobs = no citizens. Lakeview - One might start to wonder what was done to upset God so much. 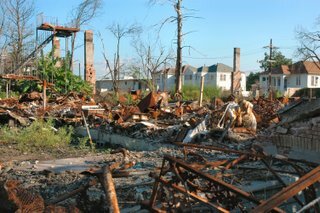 Five months after Katrina, a tornado blew through this neighborhood, destroying much of what the hurricane missed. 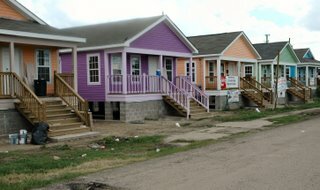 Bywater – Musician’s Village - Habitat for Humanity and other organizations are building four square blocks of new homes for local musicians and artists who lost everything in the flood…so their creative contributions can stay in New Orleans. 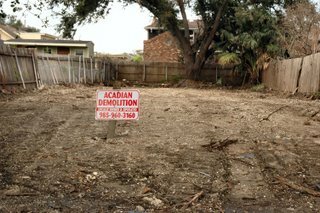 Lower Ninth Ward – The repaired floodwall on the Industrial Canal stands behind all that remains of a home. 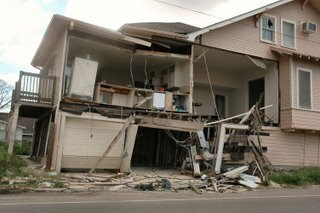 Lower Ninth Ward – Houses floated off their foundations until other objects stopped them…in this case, a brick house. Nature softens the scene with green overgrowth. One year after this vibrant neighborhood was destroyed, it has the look of a ghost town, abandoned ages ago. 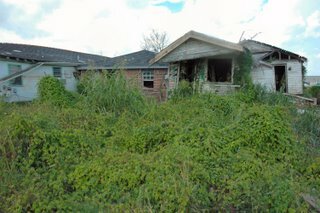 Lower Ninth Ward - On the anniversary of the storm, NBC Nightly News broadcast from this spot. Relatives in Baton Rouge who recently went to help build houses say that few underground power, water, etc. have been rebuilt, so they could not even start. Nice job Ted. Very informative.